On my 18th birthday, I went out with some friends and so it was the first time I'd needed to use a clutch since prom so I got out my trusty clutch I used for prom (which I've done a post on here) and filled it with essentials that I thought I'd share with you today. Touching up products is what seems to take up the bulk of my clutch. My trusty but actually no longer with us One Heck Of A Blot Powder with a brush was probably the most important essential for my shiny face. The lipstick I was wearing which is another loved favourite of mine: Kate Moss 09 was thrown in and then my Collection Concealer for good measure. For make up, I feel there's no point filling it with anything else other than maybe some mascara but, for me, those 3 are enough. I guess you could call it a beauty thing, but I also found this travel friendly perfume in the scent Little Red Dress from Avon. It's not a scent I reach for everyday but I think it's a nice night fragrance and it's great I can slot it into my bag. Avon always have some small sized perfumes in their sale sections so definitely check them out! As for anything else, my phone is an important. Yes, to contact people but to also take some great selfies on to look at the next morning when you're half asleep. Chewing gum is a great one to pop in your purse. I get a dry throat sometimes and, while it's not a mint. chewing gum works for me. If you're going out in heels, plasters! Whether it ends up you using them or one of your friends, they will come in handy. So there are my clutch essentials. Just a quick one today but I hope you enjoyed it all the same! 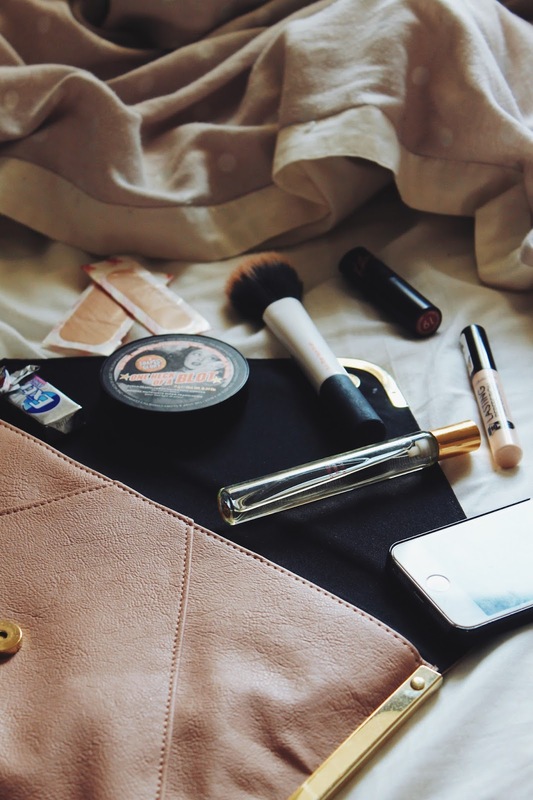 What are some of your clutch bag essentials?